Everyone has their trusted advisor. For the Catholic, it’s their priest. For the Don, it’s his consigliere. For me, it’s my Beer Guy. (While women are many times the superior in their ability to discern flavors [most supertasters are women], for the sake of this blog, I’ll be using the male pronoun – we can argue about this at a later date.). What makes a good beer guy? Well, he has to know his stuff and he has to have the inside track. He has to be able to procure the finest when he needs it. Ideally he’s not only a beer guy, but he’s also an oenophile. It may be overstated in this wonderful age of craft beers, but a great beer can easily compete in complexity with the best wines in the world. That’s why my beer guy has to be knowledgeable. Knowing whether cascade or centennial hops were used for aroma is as important as knowing the difference between a 2005 and 1992 Bordeaux (’05 is fabulous ’92 is really quite dreadful). I’ve had a beer/wine/liquor guy in every city I have lived. In the Charm City, I go to my man Harry at the Liquor Pump to guide me to the new and exciting beers and wines that come his way. I spoke with Harry about my fledgling project (yes, the blog you are reading right now) and for (at least) the rest of the summer, I have put myself in Harry’s more than capable hands. Each week he is going to choose my beer of the week. 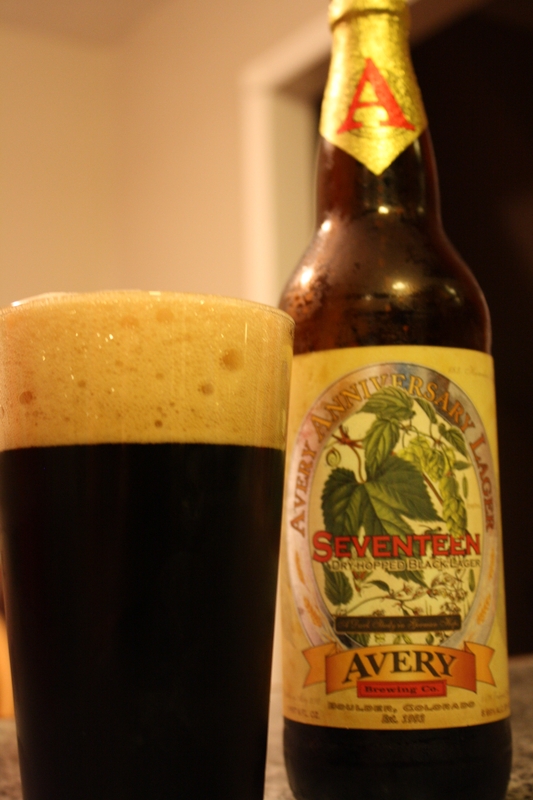 This week he selected an absolute winner: Avery Seventeenth Anniversary Black Lager by Avery Brewing Company out of Boulder, Colorado. The pour is nothing like a traditional black lager. This lager pours as dark as a Caligula’s heart, but with a sandy tan head. It’s has the appearance, although not quite the consistency, of a stout. It also has the aroma of a stout. The nose is very malty with lots of dark chocolate. The first taste is also very much like a stout, but it is more thin across the tongue. It has heavily roasted malts that are almost, but not quite burnt that compliment the aforementioned chocolate scents, but much they are much more sweet on the palate than on the nose. This lends itself to a bit of a caramel character. Fortunately, this beer is more heavily hopped than I expected. This beer teeters on the edge of cloy sweetness, but the generous amount of German hops give a strong sense of earth and pine that bring it back into balance. As I was writing my notes after my first taste, I noticed a touch of unsweetened vanilla that tickles the back of the tongue at the very end of this pleasantly long finish. However, there was a flavor component in the middle of the tasting that I couldn’t quite place. This taste had hints of a dark red fruit. I was tempted to declare it to be an overly ripe Bing cherry, but that wasn’t right. That was the chocolate component’s influence on me. Like a struggling politician I was flip-flopping constantly. I finally surrendered to my better half (who, while not quite a supertaster has a palate that I have yet to see matched). She tasted. She waited. She held up her finger; looked at me and smiled. She went to the refrigerator and grabbed a box of fresh strawberries. I was flummoxed. That couldn’t be right. I needed another taste. My wife is responsible for turning me into an unforgiving oenophile. Before I fell into her clutches, I couldn’t tell the difference between an Australian Shiraz and an Oregon Pinot Noir (this, if nothing else, shows the powerful and positive influence a good woman can have and more importantly it demonstrates that there is hope for all of us). One of my first lessons from her was to inhale through my nose while the wine is entering my mouth to enhance the flavor and better discern the flavors. This trick is incredibly useful for tastings in every possible scenario obviously including, but not limited to beer. I use this trick once again as she pulls out the box of strawberries. As is expected, I bite into a strawberry and savor the sweet intense flavor. I wait just a moment and taste the Avery. It’s wrong. I look at Red with a raised eyebrow and shake my head. She in turn gives me The Look. I realize my mistake. It isn’t the taste of the strawberry that I can’t place; it’s the smell of the strawberry that is the unrecognized flavor component. That previously undefined red fruit note is best defined as tasting the way a perfect summer strawberry smells: slightly earthy, red, ripe, slightly sweet, and distinctive. This libation is for a beer drinker. It has an alcoholic pinch in the mouth, but for anyone who drinks big beers this is not only expected, but enjoyed. I found the bite to be more subtle than I would expect for such a big beer (8.69% ABV). I recommend this beer wholeheartedly. While I didn’t try it, I absolutely believe that the Avery would hold up to a light to medium body cigar. A Costa Rican cigar or a light Dominican would be a nice accoutrement to this beverage (a cigar and beer pairing post is in the works). So, with a tip of my glass to Harry, the Avery Anniversary, and his future choices, I bid you adieu and good drinking. ~ by its12oclocksomewhere on July 28, 2010. Jason, I hope I’ve caught you before you partake in this wonderful beer. If you can resist your urges I would wait a couple of months. It is a bit heavy for the dog days of summer. However, when the weather turns just a tad too cool to sit on the deck and enjoy a cold one, the temperature will be perfect for this beer.